Hello! I've got another wonderful wedding for you guys today! The gorgeous couple are Sara and Dylan, two people that anyone would love to know. Their wedding day was truly breathtaking! The theme was peacocks and I absolutely loved how well the bride wove the colors into every aspect of the wedding. 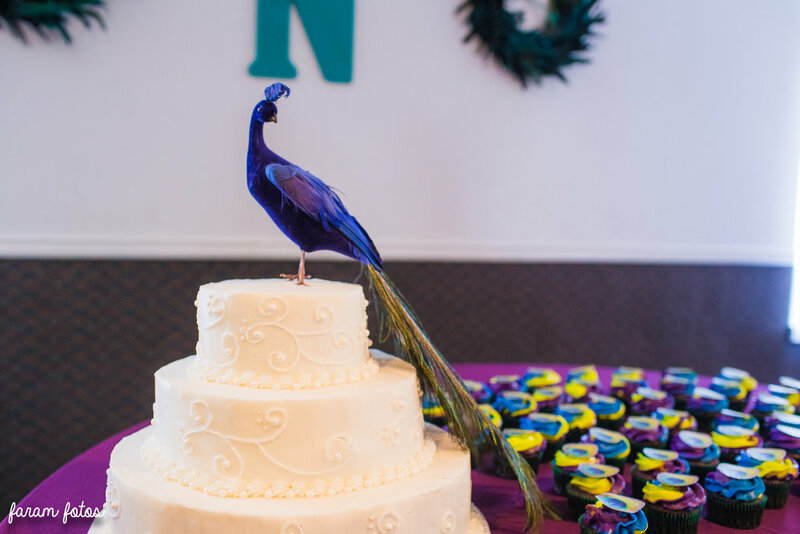 From the cupcakes adorned with edible peacock feathers to the custom bouquet she ordered online that had glittering gems in the bright array of colors, everything matched wonderfully. The bride's dress was seriously gorgeous, too. And I'm not just saying that! We shot her bridal portraits in April and I was blown away by how gorgeous she looked! I couldn't wait for Dylan to get that first glimpse of his bride as she walked down the aisle. The first look was certainly no disappointment! This is my absolute favorite part of a wedding. 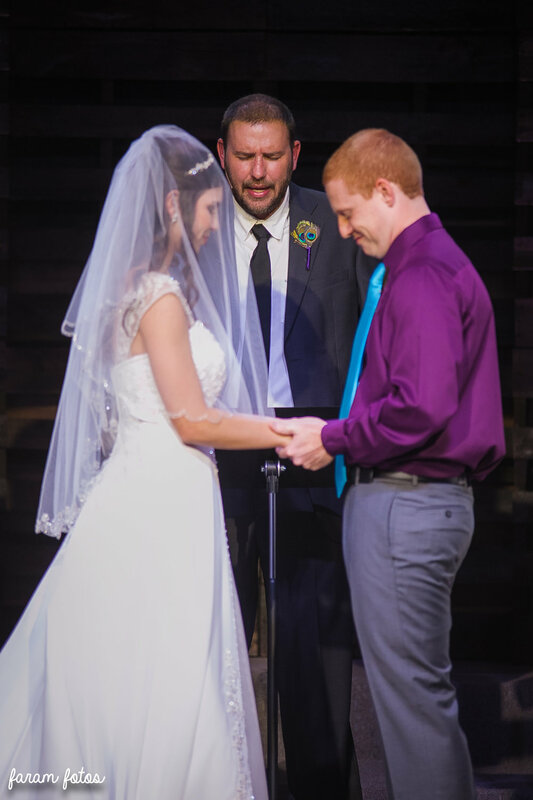 The wedding and reception were held at First Baptist Church or Rio Vista, where Sara grew up. Everything was decorated to a T by Sara and her mom. They did a really great job! I got to work with the talented Ordoñez Photography, which was so much fun! She helped me so much setting up shots and making sure everything went smoothly. OK, now just for some more pictures! Sara and Dylan were such a delight to work with and I wish them many wonderful years to come. "Do you know of a pretty place to take pictures?" I can't count the number of times I've seen this question posed in a Facebook group. Clients always ask me where I like to take pictures. So I thought it'd be a good idea to share photos from some of my favorite locations to help clients select the location for their shoot. 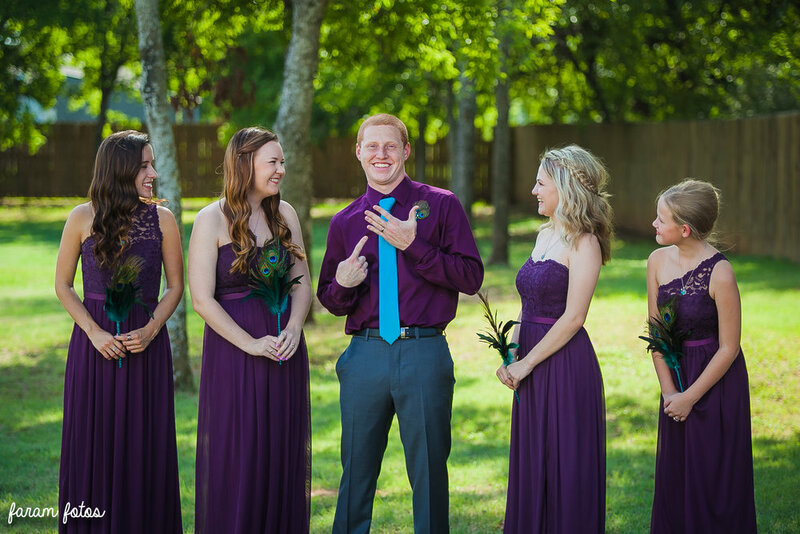 Modeana, Texas, is a wedding venue that is hands down one of the prettiest places for pictures! The property is 27 acres and has beautiful oak trees. The rustic setting is a great location for families and seniors. Note: Since it is a wedding venue most Saturdays are booked. Sundays usually are not a problem but I will check before scheduling to see if it’s available. One of my favorite places to shoot is in my own backyard! Mountain Valley and Lakewood are two beautiful neighborhoods in Burleson/Joshua. There are several different locations throughout the two neighborhoods that provide beautiful backgrounds and lighting, especially in the fall. Russell Farm Art Center is one of my absolutely favorite places to take photos! The landscaped terrain is gorgeous and has several barns, restored farm buildings and other rustic sights. It's an amazing property that the city allows free use of. Note: It is not open on Sunday. Old Town Burleson is an amazing place to take photos! I like to take photos in the business section. The lighting there is to die for in the afternoon/early evening. This is a great spot for those wanting more of an urban look for their session. If you're from Texas — and perhaps even if you're not — you know what the Fort Worth Stockyards are. It is a popular tourist spot which also has lots of rustic views that make great settings for photos. This is another great free venue. There is some paid parking but free parking is available with not too far a walk. The Fort Worth Water Gardens is a beautiful place for photos! The lighting is amazing in the evenings and the surrounding water makes for gorgeous backdrops. Of course I'm always up for suggestions if you have a location in mind. If it's somewhere I haven't taken photos before I'd love the opportunity to see it before to get an idea of the best time of day for lighting. But don't be afraid to request a specific location! Welcome back! Today I want you to meet Scott, a senior at Burleson Centennial High School. Scott is involved with many extracurricular activities including cross country, Blue Crew and Academic UIL, competing in Math, Number Sense, Science and Track. After high school, he plans to attend the Texas A&M Maritime Academy at Texas A&M University at Galveston and major in Marine Engineering Technology. Best of luck to Scott. I know you'll do wonderful things!